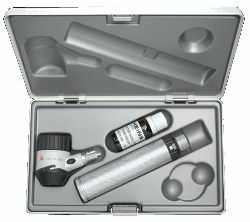 For dermatoscopic examination of pigmented skin lesions and early diagnosis of malignant melanoma. Dermatoscopy oil is applied to the skin to make the outer skin layers more transparent. The DELTA 20 makes structural changes visible. The differential diagnosis of initial malignant melanoma and other pathologies is made easier and more accurate with DELTA 20. High-resolution optics with achromatic lense system. 10x magnification, distortion-free edge-to-edge, very large, highly-detailed image. LED illumination close to daylight. 6 LEDs or, alternatively, lateral illumination from 3 LEDs for improved contrast, virtually unlimited working life. Adjustable Eyepiece. Individual focusing, range of correction – 6 to + 6 dpt. Detailed compendium with photographic atlas included. Simplifies the differential diagnosis of pigmented lesions. 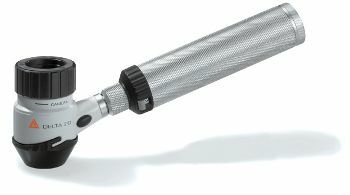 Digital photography with the dermatoscope when combined with an adaptor for a digital SLR camera.